Learn more about Thai massage and the Thai Bodywork School at this 2-hour intro workshop. Experience basic Thai massage techniques, meet Thai Bodywork faculty, staff and students. 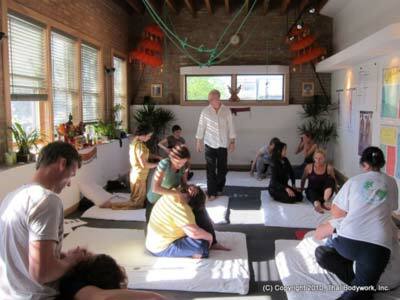 Thai Bodywork offers one of the top Thai massage-specific instructional programs in the country. Most courses are taught by master instructor Chuck Duff. Our program is workshop-based and accomodates real world schedules. Students can fit our program around jobs and family, and take courses at a pace that they determine. Our 20-hour Level 1: Fundamentals of Thai Massage training is taught monthly and has no prerequisites -- anybody can enter our program with no prior background. You will receive a Thai Bodywork certificate (and NCBTMB CEU certificate of Achievement if desired) at each level. Chuck's teaching places a strong emphasis upon sustainability in practice, body mechanics, connections with yoga and therapeutic focus. Chuck is the originator of Clinical Thai Bodywork, a modality that combines trigger point therapy and Thai massage in a very effective modality for pain and dysfunction. Our clinic offers apprentice and professional Thai massage at reasonable rates. Book a session at 847-440-7525 to experience the work first hand.